Cape Cod summers are supposed to remain reassuringly the same, but everything falls apart when three sisters and their families come together for their annual summer vacation—and they are carrying more secrets than suitcases. 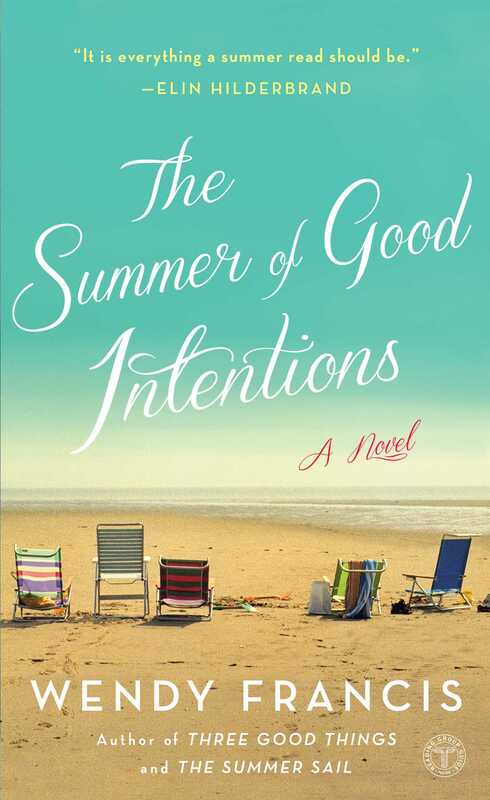 Poignant, compelling, and so real that you could shake the sand out of the pages, The Summer of Good Intentions is by a rising star who aims her fiction square at the heart of readers who love Elin Hilderbrand, Dorothea Benton Frank, and Mary Kay Andrews. The salty Cape air blew in through the window, and Maggie listened to the steady thump of blinds hitting the windowsill. The spot next to her in bed was empty, the sheets dimpled. Mac must have already gotten up to fetch the paper and coffee at the Blueberry Bagel down the road. It was one of her favorite things about their annual month on the Cape: iced coffee waiting for her on the kitchen counter when she managed to pull herself out of bed. For eleven months of the year, she was the one in charge, responsible for waking the kids, making sure they were dressed before they climbed on the bus, packing their lunches, ferrying the twins to dance, soccer, drama, and entertaining baby Luke. Of course, Luke was no longer a baby. He’d be entering kindergarten in the fall. But in July everything shifted. Mac was home, and at last, Maggie had some precious time to herself when she could sit in the sun or nurse a glass of wine after dinner, looking out over the ocean without a care. Or, at the very least, she could pretend she didn’t have a care. In July, Mac turned off his scanner, and the office knew better than to bother him unless a case turned up that only his expertise could unriddle. Maggie had understood it wouldn’t be easy being married to a Boston cop when she walked down the aisle fifteen years ago, but she wasn’t prepared for the constant worry of whether her husband would return home at the end of his shift. The worry had nearly driven her crazy during the first years of their marriage, but then the twins were born and a whole new host of concerns emerged. Her fears about Mac had faded to a low-grade hum that played in the background of her days. On the Cape, however, for this one precious month, the family had Mac all to themselves. Safe was all she could think. Happy was what she felt. She rolled over and felt the heat drifting in like sheets on a breeze. The sun pooled on the wide plank floors of the master bedroom. The house was quiet. Either Mac had taken Luke, her usual first riser, to the coffee shop with him or Luke was still asleep like his sisters. They’d arrived last night—a jumble of bags, canvas totes, coolers, and inflatable water toys—as the sun was starting its descent in the sky. The drive, normally an hour and a half, had unspooled into nearly three with the vacation traffic. The kids’ iPads and I Spy had entertained them for the first hour, but eventually the children had whined with impatience. Maggie could hardly blame them. They inched their way through the Hingham merge, where traffic always slowed, then past Marshfield and Duxbury. The giant wind turbine spun up ahead, a towering white knight in the evening sky. When at last they reached the Sagamore Bridge, she silently thanked the heavens. Greeting them, as it did each summer, was a sign from the Samaritans that asked in bold letters, ARE YOU DESPERATE? with a number to call posted underneath. It always gave her a perverse chuckle. How did they know, Maggie wondered, that carloads of parents were ready to jump off the bridge at this precise moment? The shock of verdant green that met the eye as they topped the bridge surprised her each July. On either side of the canal, blue and purple hydrangeas dotted the roadside and swayed in the cool evening breeze, as if waving to them in greeting. In this final stretch, Maggie exhaled and finally allowed herself to enjoy the familiar mix of humanity around them. Rickety pickup trucks packed with lobster crates rode bumper-to-bumper with expensive convertibles on their way to catch the last ferry to the Vineyard or Nantucket. Plenty of SUVs, like theirs, were loaded to the top for a summer’s escape. In some ways, the house on the Cape felt more like home to Maggie than their rambling Victorian on Boston’s South Shore. The summer house, where she and her sisters had been coming since they were little girls, held some of her most precious memories: fireworks on the beach, late-night s’mores, her first kiss, her first heartbreak, and the day she and Mac were married under a big white tent on the sand. Her dad had been down in May for a general check of the place, but a musty smell, coupled with something sweet, like air freshener, greeted them when they pushed open the front door. Maggie pulled back the heavy curtains and threw open the windows in the common area, then shooed the kids upstairs to do the same. She tugged the dusty sheets off the couches and hung them on the deck to air. Eventually the lights flickered on (though it was always a wild card as to whether the electric company had actually turned on the electricity on the date they’d requested) and the water began gurgling up through the pipes. Ah, summer, she thought. At last. The Cape house was cozy, manageable. A common room filled with well-worn couches opened onto a deck with stairs that led directly down to the beach. An antique chest of drawers housed the board games played over the years—battered boxes of Yahtzee, Monopoly, Life, all with missing pieces. Upstairs was a modest master bedroom, a guest room with a double bed, and the kids’ room, with three bunk beds and barely passable rows in between. The kitchen, with its 1950s linoleum floor, was stuck in time, but Maggie thought it charming, especially the wallpaper with its happy yellow roses. From the kitchen, she could see the dining area, where a long wooden table served as both their supper table and late-night game console, scattered initials carved into it from when they were young. Coming here was like falling into the arms of a comfortable, familiar lover. She’d had a slight scare, though, when she flicked on the downstairs bathroom light last night and discovered the bottom window transom broken, a few pieces of glass punched out. A swirl of dark dots lay splattered across the white tile floor like chicken pox. She bent down to touch them, then pulled her hand away. Was it blood? Dried blood? “Honey? Can you come here?” she called out. Had someone broken in? Were they still in the house? Her thoughts raced to the kids upstairs. Mac arrived to investigate. “In May?” She grabbed her cell phone and punched in Arthur’s number. At first, her dad had pretended not to know what she was talking about. “What? A window? Where?” But after Maggie described the damage, he grew frustrated. “Why didn’t you say the bathroom window? Yes, yes, that was me. Broke the damn thing trying to open it. Forgot to call Jay.” Jay was the family’s handyman on the Cape. But the conversation had nagged at her last night. “Don’t you think it’s weird about my dad and the window?” she asked Mac in bed. He was nearly asleep, weary from the long drive and a few double shifts the week before. “Weird?” he mumbled from his pillow. But it wasn’t like her dad to let something like a broken window go. That he’d let it sit unattended for two months was almost unthinkable. Maybe, she reasoned, he felt silly when it happened and then guilty about not getting it fixed. She decided to let it slide. This was her month not to worry! Besides, she felt guilty herself for not checking on the house all spring. She could hardly jump on Arthur for having done just that. She stretched her body down to her toes and fingertips, arms out at the sides. Today they would put in the dock. The pieces to it lay under a tarp in the backyard, and every year on the first day of vacation, they assembled the various sections that hooked together like enormous Lego blocks. Jess and her family would be arriving later this afternoon, and between the four adults—Mac, Maggie, Jess, and Tim—they’d manage during low tide to lay out piece by piece the modest dock that provided a jumping-off point for the kids all month. For Maggie, putting in the dock marked the official start of summer. She thought back to when she and her sisters were kids, how she and Jess would race to be the first ones in the water as soon as the car pulled into the driveway (they’d insist on wearing their bathing suits for the ride down). She could almost smell the scent of lavender in their freshly dried beach towels. Honestly, where had the time gone? Her parents had been so happy then. And life so much simpler. Now everything was endlessly complicated. Virgie lived on a different coast. Jess was drowning in her responsibilities as a high school principal. The sisters hardly got a chance to see each other outside of their one idyllic month on the Cape. And Arthur and Gloria had been divorced going on a year and a half now. Yes, life was more complicated, Maggie thought. And probably in no small part because she was a mother herself now. But July was her month to relax. Que sera, sera. It was one of her mother’s favorite sayings at the beach house, so much so that the words hung on a plaque in the front hallway. Right next to ABSOLUTELY NO WHINING! VIOLATORS WILL BE CHARGED 5 CENTS. Maggie kicked her feet under the sheets. This summer would be just like old times. She could feel it. She would make sure of it. Only a handful of things waited on her to-do list to ready the house for her sisters: a quick dusting downstairs, fresh sheets on the beds, and a run to the corner market to pick up a few items (they’d already packed the car full with staples, like cereal and chips). For supper tonight, they should have something that would appropriately mark the start of vacation. Perhaps a fresh sea bass or some haddock. She slipped into her shorts and a white T-shirt (her uniform during the summer) and a pair of pink flip-flops. Every summer, each child got a new beach pail stuffed with a towel and flip-flops. This, too, had become part of the Herington tradition (a summer without new flip-flops would hardly count as summer at all!). The one year she’d neglected to buy them in advance, Maggie and the girls had raced out to the nearest shop and paid three times the price she typically shelled out at Target. She hadn’t forgotten the flip-flops since. She stood at the bathroom sink and splashed cool water on her face, relieved to see the water gush from the old spigot. Last night, when the water had trickled out, she’d worried that the pump from the well wasn’t working properly. But any kinks seemed to have resolved themselves overnight. She traveled down the hall and poked her head into the kids’ room. Their duffel bags lay unopened on the floor, their clothes from yesterday strewn across the room like tossed cards. Luke was gone, but the girls still slept sprawled on top of blue cotton quilts. Only eleven, they looked so angelic when they were sleeping, their long corn-silk hair splayed across their pillows. Some days, Lexie (the girl who would surely push Maggie to the edge) already acted like a teenager, full of snide comebacks and rolling eyes. Last night she’d announced that the Cape was “boring” and insisted on asking why they couldn’t do something different. As if every child were lucky enough to have a summer house to visit! Maggie headed downstairs just as Mac and Luke burst through the front door. “Mommy, we saw a raccoon!” Luke cried. “You did?” Maggie grabbed the iced coffees from Mac and gave him a kiss. She cast a wary glance his way, as if to say, Raccoons? Already? They were a nuisance, varmints as far as she was concerned. They would have to be sure to keep the trash covered this year. When Luke started to protest, Mac interrupted his whining. “C’mon, buddy. We haven’t even had breakfast yet. Let’s go sit on the deck and eat our bagels.” With a wink, he coaxed Luke outside. Maggie finished her coffee, grabbed her wallet and backpack, and headed out to the shed. A rusty padlock hung on its latch. She twirled the numbers, the code memorized by heart, and pulled open the door, searching for the rickety three-speed that she rode each summer. It took a moment for her eyes to adjust before spying the Schwinn in back. Carefully, she navigated a path around a wagon, a line of terra-cotta pots, a Hula Hoop. A plastic baby swimming pool rested against the bike. Only last summer, Luke had liked to splash around in it when the ocean waves grew too strong. Would he still use it this summer, or had he gotten too big? she wondered. She moved the pool over so that it listed against a wall, then brushed the cobwebs off the bike’s handlebars. Slowly, she inched the bike out of the shed, careful not to knock loose the wicker basket, and added a few puffs of air to the tires before hopping on. Her dad used to ride this very Schwinn when Maggie was little. And, at the thought of Arthur, her stomach tightened again. Was it possible that the last time they’d seen him was over Christmas at their house in Windsor? She shook her head as if to clear a foggy memory. But no, that was right. They hadn’t seen her dad for six months. She knew Virgie called Arthur every Sunday, but Maggie had let even her phone conversations with him slide. They were uncomfortable, odd little exchanges where she struggled to fill the space with stories about the kids. She always hung up feeling deflated and disappointed, as if she should be a more interesting daughter and Arthur a more engaged grandfather. And now, this most recent conversation had gotten her mind spinning. Arthur had sounded, well, off. She couldn’t think of better way to describe it. As if he couldn’t imagine why she’d be calling him in the first place or what on earth she was talking about when she mentioned the window. Perhaps she’d woken him or caught him in the shower? Whatever the reason, it was unsettling. She’d feel better, she told herself, once he was here and she could lay eyes on him. Yes, it would be good for everyone to fall back into their summer routines: the kids swimming till their eyes stung from the salt water while the adults shared a cocktail or two on the deck. Maybe this would be the year Luke dove off the dock (he’d gotten so close last summer!). And maybe the twins would master the backflip. In the top kitchen drawer of the summer house, Maggie kept a spiral notebook for recording just such milestones and funny quotes from the kids, updating it each July. The first summer the twins rode their bikes without training wheels! Lexie swam out to the jetty and back. Luke walked across the kitchen all by himself! She’d always meant to transfer the scribbles to an electronic file, but there was something pleasing about seeing first her handwriting and then the girls’, their tilted capital letters giving way to more precise lowercase, then loopy cursive. On the front, Sophie had scrawled, The Book of Summer. Maggie was looking forward to catching up with her sisters, maybe playing a few rounds of poker or gin rummy. And thank goodness Arthur and Gloria were coming for separate weeks this year. After a tense summer last July when everyone tiptoed around them both, the wounds of the divorce still raw, Maggie had made certain that her parents were slotted for different weeks this time. Maggie McNeil at your service! she had thought, as she toggled back and forth between them on the phone. Let me pencil in your reservation! She followed the soft curves of the bike path, the sun warming the back of her neck. Sweeping ferns lined either side, and every so often a honeysuckle or a cape rose poked its head out. Maggie threw her hands in the air like a child and shouted, “Heeeello, summer!” No one was around. She could be carefree and thirteen again. How she’d imagined this feeling a thousand times, nurtured it as if it were her own exquisite orchid, in the depths of winter. The thought of the Cape house was the only thing that made Boston winters bearable, with loads of laundry to do and the kids climbing the walls. Just wait, she’d tell herself. Before you know it, you’ll all be back at the summer house. Eventually, the dirt path turned to pavement and wound past the charming post office (white with blue trim), the town library, an ice cream shop, a handful of quaint shops, and at last, Sal’s Market. Maggie leaned her bike against a post. Like everything else in town, Sal’s looked more or less the same and still sported its cherry red door and gray cedar shingles. When she swung open the screen door, four tidy rows of supplies greeted her along with the smell of basil and an assortment of freshly picked produce, including fat, gorgeous blueberries and strawberries the size of walnuts. She gathered up a wire basket, threw in two pints of berries and a clutch of basil, and began combing the aisles for the items on her list. She pulled a carton of farm eggs and milk from the refrigerated section, then headed to the deli and fish counter. A small line had formed and Maggie took her place behind a woman in a faded pink sundress and floppy straw hat. Probably a year-rounder, she thought wistfully. When it was her turn, she stepped up and grinned at Sal, who was busily wiping the counter. A white deli hat sat perched on top of his sandy curls, and his butcher’s apron already reflected a swift morning’s business. When he glanced up and saw her, his face beamed. “You bet.” Maggie eyed the specials on the blackboard behind him: STRIPED BASS; BLUEFISH; SCUP; TUNA; HADDOCK; HALIBUT; COD. “Wow.” Sal’s face softened. “They grow up fast, don’t they?” Maggie nodded. “Are your sisters headed in, too?” She grinned. She knew that Sal had a soft spot for Virgie. Gretchen had been coming to the Cape for summers nearly as long as Maggie and her sisters. She and her husband had two kids, and occasionally the families would get together for a beach day and cookout. Maggie noticed that her friend had gone blond this summer. “What?” Gretchen called after her in mock surprise. “You finally got rid of that vintage rotary phone?” Maggie grinned. Gretchen’s summer house was nothing like hers. A colonial with five bedrooms and three baths, it was a restored sea captain’s mansion that they’d bought when the market was down. There was nothing “camp-like” about it, but Maggie knew that was how her friend liked it. If she couldn’t find luxury living along the beach, Gretchen wouldn’t have deigned to come to the Cape in the first place. Sparrows chirped in the old oaks and pines that flecked the town square. Maggie inhaled as she rode along, a mix of salt and pine stinging her nose, and felt curiously free. Only a few summers ago she’d fretted she would never escape the days of diapers and binkies and then potty training with Luke. And that cumbersome car seat! It drove her crazy, how Luke would howl about the seat belt cutting into his chest. Until one day, she glanced in the rearview mirror and saw all three kids buckled into their seats, the diagonal strap crisscrossing Luke’s shoulder, and Luke uncomplaining. A small miracle! There were so many milestones like these, Maggie thought. They seemingly happened overnight after she’d waited forever for them to occur. She pulled up to the house and parked the bike. When she stepped inside, all was quiet, the girls still asleep. She set the groceries on the counter and wandered onto the deck, shielding her eyes from the sun with her hand. There. About a quarter mile down the beach, she could make out the profiles of Mac and Luke. She let herself out the gate and went down the steps to the boardwalk, the sea grass tickling her calves as she pulled off her flip-flops. At the shore line, the icy cold water lapped at her toes, but she knew from years of summers that it would grow warmer as the day went on. She was about to call out to them, but something stopped her. On the horizon, white fleecy clouds hung in a sky that was colored a perfect robin’s-egg blue. The bright sun danced on the water. Above her, gulls dipped and soared, calling out to one another. Maggie inhaled the salty air and dug her toes deeper into the sand. She was searching for the right word to describe the shimmering world before her. Then it came to her: hallowed. This was hallowed ground, the place that gave her the most peace, her own private retreat. Each summer, she resolved to toss out her to-do lists, lengthy spools that ran through her mind like ticker tape most days of the year. After years of self-recrimination, she’d resigned herself to the fact that she liked things to be just so. Type A, Mac called her. But in a way that I love, he reassured. But was it really so bad? So what if there were individual cubbies for the kids in the mudroom? So what if the kitchen in Windsor had a whiteboard with the children’s activities detailed in color-coded marker? And her linen shelves were methodically labeled: GIRLS’ SHEETS, LUKE’S SHEETS, M&D SHEETS, PILLOWCASES, EXTRA BLANKETS?? She kept things organized. She kept the family running. They needed her. But on the Cape, there was no need for such charts. Because everything was already as it was supposed to be. Que sera, sera. And if anything were amiss, if Arthur, for instance, was acting a little odd, well, it would be righted at Pilgrim Lane. That was what the summer house was for. Standing on the beach, she was also struck with the realization that this was the place (the summer house, of course!?) to tell Mac what she’d been dreaming about the last few months, an idea she desperately hoped he’d be open to. Time would tell. Slowly she lifted her right leg up, toe pointing toward her knee, and swept her arms above her head. Her Tree Pose. She pressed her fingertips together and inhaled, willing her body to remain balanced on one foot. Yes, she thought. She could feel some of the tension slipping away, feel her heart opening to the possibilities of summer. Until, that is, Lexie shouted from the deck, “Mom! Sophie took my towel!” Followed by a wail, which Maggie was quite certain came from Sophie. This reading group guide for The Summer of Good Intentions includes an introduction, discussion questions, ideas for enhancing your book club, and a Q&A with author Wendy Francis. The suggested questions are intended to help your reading group find new and interesting angles and topics for your discussion. We hope that these ideas will enrich your conversation and increase your enjoyment of the book. The Herington sisters and their families come together for their annual vacation at their Cape Cod summer house. Life there is supposed to remain reassuringly the same, but they quickly realize that their relaxing summer vacation is jeopardized by each sister’s secrets. Through poignant and engaging storytelling, Wendy Francis offers a fresh new summer read that takes readers through the complex and emotional web of family relationships. 1. All the Herington sisters, particularly Maggie, think of their summer house as a place of comfort and relaxation. What does the house symbolize for each sister? Do you have a place where you, too, can escape the routine of everyday life? 2. For Maggie, summer is represented by “sticky fingers. The smell of mosquito repellant. The wind whipping up, then settling down again. Her husband’s arms around her. The sounds of the kids laughing.” Virgie thinks it’s not really summer until she steps into Grouchy Ted’s and breathes in “the familiar scent of beer and peanuts.” What does summer mean to each sister? What makes these memories so significant? What do you think of when you think about the summertime? 3. Describe the relationship between Maggie, Jess, and Virgie. What are their roles in the family? What do they teach you about sisterhood? and return his kisses was further testament to the fact that her marriage wasn’t working. She wasn’t in love with Cole.” Do you agree with Jess’s assessment of her failing marriage, or do you think she’s making excuses so that she doesn’t have to take responsibility for her affair? 5. How would you characterize Gloria’s role in her daughters’ lives? Does her elusive and carefree personality put a strain on her relationship with them? 6. How does Tim learn to forgive Jess and move forward with their relationship? Can Jess trust that Tim will now change his attitude toward their marriage? Can Tim trust Jess? 7. Why is it so difficult for Maggie to tell Mac she’d like to have another child? How do you think Mac handles the news? 8. How does the fire Arthur accidentally started bring attention to issues he has been keeping under wraps? How do his daughters interpret the accident? 9. Arthur has an epiphany right before his death. “He rubbed his hands together briskly, thinking of Gloria. Always of Gloria. Yes, a dip would be just the thing to mark a fresh start, his resolve to embrace life anew.” Describe the irony of this scene. Why do you think the author included it? has her diagnosis offered her a different perspective on both her career and her relationship with Jackson? 11. Do you think there was an active denial of Arthur’s illness in the Herington family? Maggie realizes, “There had been plenty of signs—Arthur’s absentmindedness, the collection of trash he’d started at her house, his overstuffed car—but she’d written them off as typical for a slightly scatterbrained older man.” How did each family member deny the signs? If they had been able to confront Arthur’s illness head-on, would the story have had a different outcome? 12. Arthur’s daughters are shocked to discover that he has been living in squalor. Maggie thinks, “There was something terribly cruel about the juxtaposition of a life filled with so much junk and a life irretrievably lost. Arthur had died drowning, but he’d been drowning long before that.” What was Arthur drowning in? Why did he start hoarding? Why do you think Arthur never told his children about his problem? 13. How does each woman—Maggie, Jess, Virgie, and Gloria—move forward after Arthur’s memorial service? How do their memories of Arthur inspire each of them to do better? 14. The essence of this story is about strengthening family ties and romantic bonds. How does each Herington sister accomplish this? 15. In the beginning of the story, Maggie remembers that Que sera, sera is one of Gloria’s favorite sayings—they even have it on a plaque in the house. What does this saying mean? Is this message as relevant at the end of the book as it was at the beginning? 1. The Book of Summer was Maggie and her family’s notebook of special memories, funny moments, and important milestones that they collected each summer at their Cape Cod summer house. Create your own notebook to memorialize special times in your life. Write a brief entry, even just a few sentences, for each funny anecdote or exciting moment that you experience with your family. 2. What are your good intentions for the summer? Share with your book club. 3. Visit Cape Cod. The peaceful beauty of the Cape comes to life in the pages of The Summer of Good Intentions. Plan a summer vacation to explore the beaches and the history of one of New England’s most popular vacation destinations. 4. Read Wendy Francis’s first novel, Three Good Things, for your next book club meeting. Filled with love, humor, and the scent of the delectable Danish pastry called kringle, Three Good Things tells the story of two midwestern sisters, each with a secret. You can even bake kringles as a special treat for your group using the recipe on page 233 of the book. 5. Wendy Francis does a wonderful job introducing two important, serious health conditions to readers: multiple sclerosis and hoarding. To learn more about MS, visit the National Multiple Sclerosis Society’s Web site at http://www.nationalmssociety.org/. To learn more about hoarding, visit the Anxiety and Depression Association of America’s Web site at http://www.adaa.org/understanding-anxiety/obsessive-compulsive-disorder-ocd/hoarding-basics. Despite being sisters, Maggie, Jess, and Virgie are very different and very dynamic individuals. Which sister do you relate to the most? Maggie is probably the sister with whom I identify the most. I’m at that age where my six-year-old son is growing up at rapid speed and I’m wondering what’s next. Who else needs nurturing? My husband likes to joke that I’m always trying to fix things for people, and that’s probably not far from the truth. Though I hope I’m not a meddler, per se, there’s still some of that midwestern girl in me, the one who wants to set things right and make sure everyone is happy. Like Maggie, I also love the beach; summertime; and the slower, languid pace that those things suggest. Was the setting of the story important to you? Why did you decide on Cape Cod? As much as I love the Midwest (where my first novel was set), I also love the seaside. Even as a young girl in Wisconsin, I would search out whatever pockets of beach I could find, usually just a slice of sand next to a water-filled quarry. Once I moved east and settled closer to the ocean, I felt as if I’d found my second home. I’m also fortunate in that my in-laws have a house near the Cape, which has become a favorite retreat for all of us during the summer. So the rhythm of the waves, the sound of crickets whirring at night—all those things were familiar to me. What’s more, it seemed a summer house would be the perfect setting for the sisters’ emotions to percolate and collide. Each chapter is told from the point of view of a different member of the Herington family, except Gloria. Why didn’t you write from Gloria’s perspective? It never really occurred to me to write from Gloria’s perspective. She was always a bit of an outsider in the family, and I thought it should remain that way. Besides, Gloria is such an opinionated, zany character, I’m not sure I could have handled going into her head! Did you plan how you were going to develop each character’s journey, or did their stories evolve as you wrote the book? For better or worse, I’m one of those writers who let the characters guide the story. I’ve never been able to map out a novel’s plotline in its entirety (though I wish I could!). All the sisters, I knew, would be dealing with some kind of conundrum, and once I determined that Arthur had a hoarding problem, all the other elements began to fall into place. The Summer of Good Intentions emphasizes the strong bonds between sisters. Do you have sisters who helped inspire this story? No, but my mom was my best friend, and in many ways, like a big sister to me. I’m a big believer in the support system that women can provide for one another, whether as sisters, mothers and daughters, grandmothers and granddaughters, aunts and nieces, or good friends. 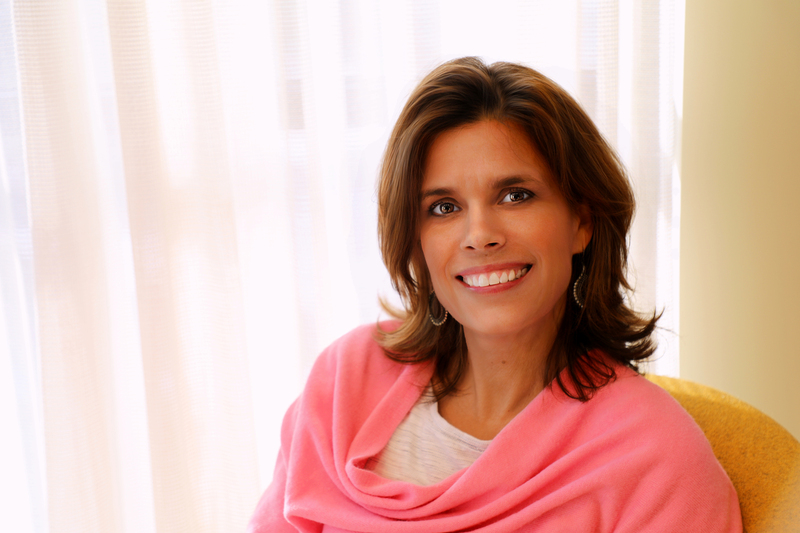 How was writing this book different from writing your first novel, Three Good Things? Looking back, I feel as if Three Good Things almost wrote itself. Don’t get me wrong: it took multiple revisions and drafts! But, as my agent likes to say, first novels tend to live inside an author’s heart for a long while. Somehow I felt as if I knew Ellen and Lanie in that book, as if they were my neighbors. I wasn’t sure I could ever feel the same way about another cast of characters. Also, as a former book editor, I was all too familiar with the curse of the second novel, when authors get stuck wondering if they’ll ever write another book—or was the first novel just a fluke? The Summer of Good Intentions had some false starts for sure, but eventually, I found myself falling in love with all these women, and Arthur, too. You tackle very emotional and complex issues in The Summer of Good Intentions: divorce; infidelity; expanding a family; and health matters such as memory loss, MS, and hoarding. What literary challenges did you face to properly address these subjects in the book? The challenges in tackling the various health issues here was to reveal them over time, as the characters’ stories played out, and to resist the impulse to infuse the book with research and statistics. I’d done a fair amount of research on MS and hoarding, and at points the book veered into textbook territory—thankfully, those sections were cut! As for the more everyday issues, I really just trusted my own emotional instincts to guide me through the characters’ thoughts and reactions. With luck, they ring true in the book. As a former book editor, how does writing your own book compare to editing someone else’s? What’s the biggest challenge for you in the writing process? Oh, my goodness, writing is much, much harder than editing! And I’d had no idea. You think when you’re an editor that you have a fairly good understanding of how a book should be written. But when it’s you staring at the blank page, you realize just how impossible and insurmountable the whole writing thing is. Given that, it’s amazing to me how many great books get written. The biggest challenge in my writing is turning off my editor’s ear so that I can focus on getting the characters and story down on the page. Otherwise, I’d be tempted to revise every sentence as soon as it’s written, and it would take me about ten years to finish a single chapter. If your readers were to take away only one message from this story, what would it be? conclusion I think Maggie comes to by the book’s end and the one that I hope readers will take away from this novel. Can you share with us any news of upcoming writing projects? What can we expect from you next? All I’ll say is that my new novel involves plenty of family drama once again—and a boat. Stay tuned! "Wendy Francis's book thrilled me like a ride in a race car along the coast with the top down. It is everything a summer read should be." "The Summer of Good Intentions is a tender and vivid portrait of a family by the sea, of three unforgettable sisters and the tidal pull of their love and secrets. Wendy Francis is a wonderful writer. She made me feel the salt air." "There is much to like in Wendy Francis's The Summer of Good Intentions. Love in all of its messiness is written with convincing thoughtfulness and insight, each flawed character beautifully and realistically portrayed. Feel the sand between your toes as you explore the special bonds of sisterhood and family in what promises to be one of the best books of summer." "I was immediately engrossed by this story of three adult sisters who share their own bonds, heartbreak and challenges. So much more than a beach read, this very real, poignant, and funny novel will make you look at your own family in fresh, new ways." "A compassionate and warm family drama filled to the brim with characters who feel like old friends." "It has a pull to it...thanks to the author's skillful writing and realistic dialogue. Maybe this is what's meant by an 'addictive' summer read." "Heat Index: What do you get when you mix family, secrets and a mysterious accident? A messy and engrossing scorcher of a story that we couldn’t walk away from even after the sun went down.